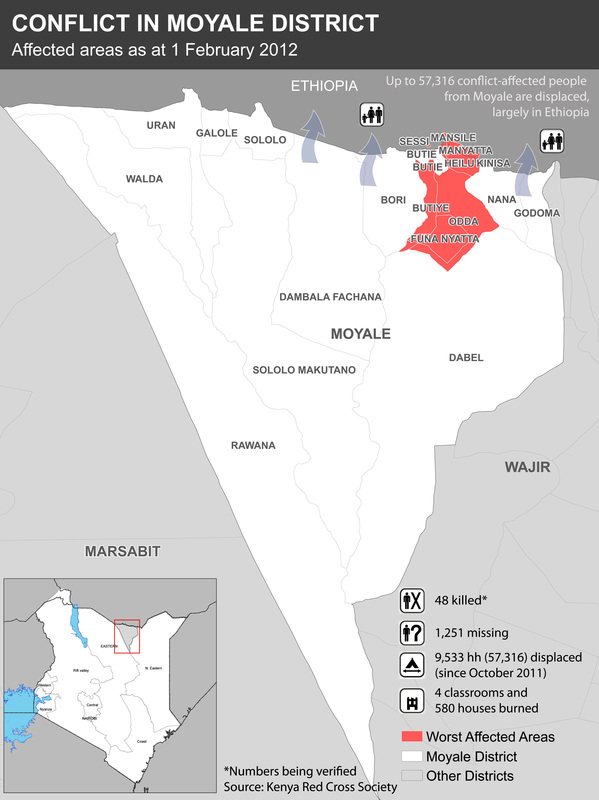 Politically motivated violence in the northern Kenyan town of Moyale, which has left dozens dead and tens of thousands displaced in recent weeks, shows little sign of abating and there are fears that the clashes could continue until elections are held for new local government positions. The main two pastoralist communities involved, the Borana and the Gabra, have a long history of sometimes violent competition over resources. But by many accounts, an unintended consequence of Kenya’s new devolutionary constitution has raised the stakes considerably. The prospect of real political and budgetary power - concentrated since independence in distant Nairobi - rather than water, pasture and cattle-raid vendettas, now drives the violence. “Every conflict in 2012 will have political and ethnic implications and can therefore not be treated as normal criminal activity,” Mzalendo Kibunjia, chairman of the National Cohesion and Commission (NCIC), said in a recent statement. The NCIC is a government entity set up in 2008 to eliminate ethnic discrimination and promote inter-communal reconciliation. “The conflicts in northern Kenya must be treated as electoral related and not be dismissed as conflict over water, pasture and cattle rustling. The NCIC has established that the ongoing violent conflicts [in Moyale and Isiolo] are politically motivated in anticipation of the 2012 elections,” Kibunjia said. However, presidential, legislative and local elections might not be held until early 2013 according to a recent High Court ruling. The spate of sporadic clashes is thought to have been sparked by a single killing in early November just across the border with Ethiopia. Since then, political leaders from each community have allegedly incited violence against the other, regardless of whether those members are combatants. “Different communities used to share mixed schools, mixed waterholes, mixed shopping centres, mixed everything. Now they can’t be on the same street together,” said one aid worker, who recently visited the town. Several political leaders, including a former member of parliament, have been arrested on suspicion of fuelling the increasingly generalized conflict. “Here, a politician can kill his opponents, it happens every [election] year, but not a single politician or trader known to have planned and killed people has ever been convicted,” Aba Dika, an elder in Moyale, told IRIN. However, Eastern Province Police Commander Marcus Ochola told IRIN such impunity was on the way out. “I am confident our officers, who are still collecting additional evidence, will support strong cases against those responsible for these skirmishes,” he said. Another police official said detectives were investigating reports that some suspects had used social media to incite violence and congratulate kinsmen when prominent members of rival communities had been killed. Aid workers who visited Moyale said hundreds of houses had been burnt and that crops, livestock and property had been destroyed. There have also been reports of shortages and increasing food prices due to the interruption of transport and the closure or destruction of shops. Thousands of people – insecurity has prevented an accurate assessment - have been displaced from their homes, with many fleeing into southern Ethiopia. The Red Cross estimates that 9,500 families – some 57,000 people – have fled, 60 people have been killed and more than 1,000 houses burnt. The worst-affected areas include the settlements of Heilu, Kinisa, Buthye, Bori, Mansile, Illadu, Manyatta and Odda. The UN’s World Food Programme suspended distributions to around 2,200 people in Heilu and Odda after 15 tonnes of food were looted from stores there in late January. “The extent of displacement now and the indiscriminate targeting of the violence – women, children and older persons, any member of the [rival] community has been killed – have left people really traumatized,” said one humanitarian official, who asked not to be named. “The fear is that between now and elections [we] will see displacement and returns, displacement and returns, with nothing really in balance. There won’t be much room for manoeuvre until some sort of political solution is agreed upon. That seems very far away right now, from what we have seen,” he added. “It’s not easy to arrange peace meetings when the parties are so mistrustful and fearful of the other’s intentions. Willingness and commitment are not there at the moment, it seems. Willingness to cease hostilities has been very low. It’s quite tragic,” said the aid worker. Education has been badly affected in Moyale, with 18 of the area’s 31 schools yet to reopen after the Christmas break and many school-age children among the displaced, either in Ethiopia or in makeshift camps. Livestock trader Abduba Wario said his income had dried up because the town’s livestock market was closed and he had been unable to send his two daughters to school in the central Kenyan town of Meru. "It's risky, no trucks are available. I appeal to the government and NGOs to provide all school-children with transport and police escorts for learning in other parts of the country," he said. The state of education facilities serves as an important indicator of the wider security climate, according to the aid worker. “Children returning to school is the first step in terms of reconciliation, a return to normality. If it is safe for children to go to school it is also safe for health workers and others to return to their posts,” he said. Amid reports that leaders of warring communities have mobilized across the porous border, Kenyan security forces are working with those from Ethiopia. "We are liaising with our counterparts in Ethiopia to trace the fighters who fled when Kenyan security officers were deployed to quell the fight,” said a security official, who asked not to be named.